Some monsters get more love than others. This was especially true during my years as a teenage DM. I had old favorites that would always turn up during games, while others were never used. When I say that these monsters are underappreciated I am referring to my own games, I don't presume to know what happens at other gaming tables. Some of these beasties deserve a second look. I'd like to share some thoughts, and look for ways to make these neglected critters more fun and interesting. Thus, I thought I'd start this sporadic series of posts. These aren't your classic villains, they aren't the favorites... they're the other guys, the ones nobody bets on. Let's take a closer look. The players were unimpressed. They wanted something more fantastical to fight. I was young, a new DM, and totally unsure of myself running an adventure. I think I might have changed the ants to goblins to make my players happy. There was a fundamental truth that I knew instinctively, but I couldn't seem to get my friends to agree. Giant ants are frick'n scary! An ant can easily lift 10 times it's own body weight. If an ant were the size of a man, it could lift 1000 pounds and would be as fast as a racehorse. Using the surface tension from the moist pads on their feet, they can move almost as fast along walls and ceilings as they do on the floor. 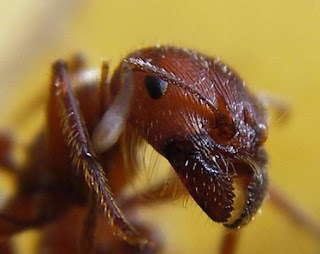 Every species has mandibles, these can account for a sixth of the total length of the ant. These powerful scissors can remove the limbs of enemies. Some ants also have venomous stingers, others can even spit formic acid up to 10 times their length. Ants have large compound eyes good for detecting movement, but see details poorly. They also have three ocelli (simple eyes) that detect a wide range of light including ultraviolet. A pair of antennae detect the direction and intensity of chemicals (scent), air currents, and vibrations (hearing). Ants identify each other through scent, any ant entering the colony mound without the scent of that particular colony will be attacked as an intruder. Some ants can also detect and prepare for rain an hour or more in advance, no one knows how... but it's true. The "Hive-Mind" might be a fallacy, but colonies are definitely highly organized. Once scouts find food they leave pheromone (scent) trails as they travel back to the hive, workers follow this path to get the food. An alarm pheromone (emitted at death) sends nearby ants into an attack frenzy and attracts others from farther away. Antennae are sometimes used to transmit and receive signals through touch. Sounds produced with their mandibles may be used to intimidate colony members or other species. Some ants tend fungal gardens within their colonies, bringing in plant material to help it grow. Ants are also the only creatures besides humans that are known to protect, herd, and feed from domesticated livestock (usually aphids or mealybugs). See? Giant ants are scary! ...and this is all assuming that giant ants are just like regular old real-life ants that happen to be 6 feet long. In a fantasy setting they could also be magically altered to breath fire, have a true hive mind, AND be able to laugh maniacally! Muaahhahahahaaaa! Oh!, and I didn't even mention the "zombie" ants, which are also pure fact by the way. Sometimes ants get infected with spores or parasites which alter their behavior in strange ways before killing/consuming them. Like this, and this, and this. Good night, sweet dreams everyone. 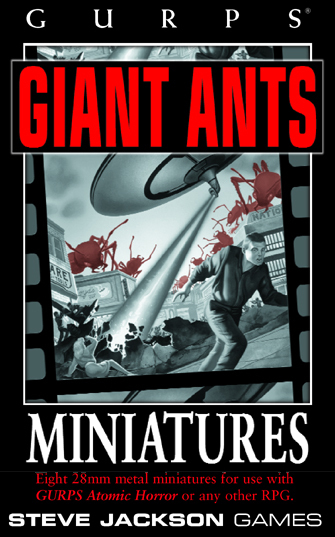 I've used giant ants in some form or fashion for every rpg I've ever run, from superheroes (the alluring, albiet evil, DVAnt used them as her shocktroops) to post-apocalyptic (they're perfect to mutant-ify) to sci-fi/horror (they escaped the lab!). And Steve Jackson Games did a great boxed set of the pesky bugs. Yeah, they're great. Heck, they showed up as a random encounter in my game and nearly obliterated the PCs that had stumbled on them. Also, thanks for new examples of the horrors nature is capable of producing. Always good fodder!